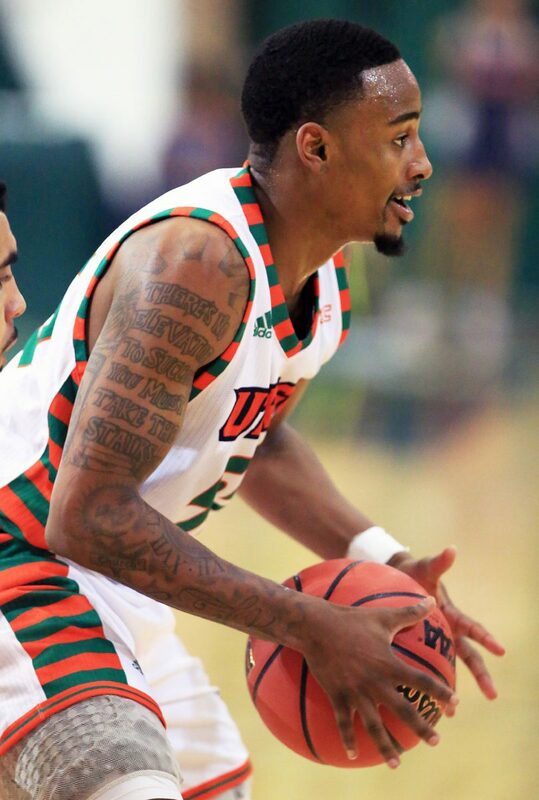 Antonio Green said a desire to be closer to his family is the “main and only reason” he decided to transfer out of the UTRGV men’s basketball program. Playing for UTRGV the past two seasons kept Green, a native of Tupelo, Mississippi, away from his 3-year-old daughter, Azyla Marie. Green also has a close relationship with his mother, Tiffany McClain, who raised Green in a single-parent home. Last February, during Green’s freshman season, the family endured the passing of Green’s 20-year-old brother, Terrence Thompson, who was shot and killed in Memphis. Green said he previously had fleeting thoughts of transferring but only began to consider it more seriously when he returned home after the spring semester. He said he had a brief conversation about his decision with UTRGV coach Lew Hill before being granted his release. Green said “a lot of schools” have already shown interest, adding that he plans to take his time evaluating his options. He said he is committed to staying at the Division I level. A 6-foot-2, 165-pound guard, Green averaged 16.7 points and 3.3 rebounds per game as a sophomore in 2016-17, hitting 111 3-pointers to lead the WAC and rank 12th in the NCAA. As a freshman, he averaged 11.6 points and 4.2 rebounds per game to earn WAC Freshman of the Year honors. News of Green’s transfer was first posted to Twitter by ESPN’s Jeff Borzello (@jeffborzello) on Friday night. Green retweeted the post from his account, @AMGJ55. Hill said he noticed that Green sometimes grew homesick during the year, but he never had any indication that Green might decide to transfer. “When you lose your second-leading scorer and No. 1 3-point shooter this late in the game, it catches you off guard,” Hill said. Hill sensed that Green was very close to his mother and daughter, and he could tell that Thompson’s passing had a substantial impact on Green. UTRGV leading scorer Nick Dixon is set to return for his senior season in the backcourt after averaging 18.8 points per game in 2016-17. Starting point guard Lew Stallworth (8.6 points per game) is also coming back, with freshmen Greg Bowie and Javon Levi set to join the guard rotation. Hill confirmed the departure of reserve players Walter Jones, Mike Nwabuzor and Gage Loy, as well as redshirt freshman Adrean Johnson. UTRGV has two open roster spots to work with as a result of Green’s transfer, Hill said.